You would think that with the increasing role of technology in our lives, the number of women working in the technology field would increase. Unfortunately this is not the case, as Fortune magazine noted, “In 2013, only 26% of computing professionals were female — down considerably from 35% in 1990 and virtually the same as in 1960”. Statistics Canada reported in 2017 that women make up only 22 percent of the total workforce in STEM fields. And for women in senior technology roles, the numbers are even more dire: according to the report published by the OECD, they are leaving because they are denied promotions, they don’t have enough role models and hence their personal network is not there to support them. 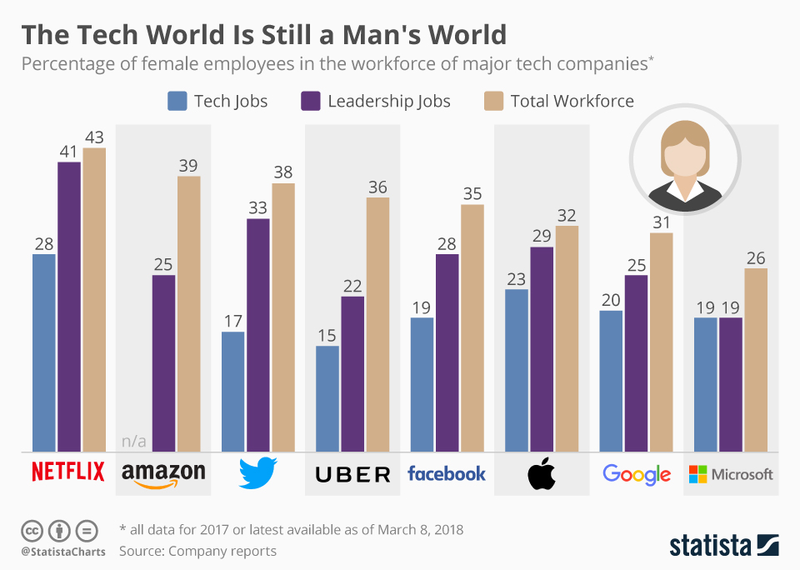 As the chart above from Statista shows, it is still a man’s world, as women are drastically outnumbered even in major technology firms such as Google and Microsoft, . So what does this mean? What can we do to improve the situation? One of the ways is to provide opportunities for women to network. A 2016 Linkedin study showed that 85% of the jobs are filled by networking. But most networks in the IT field are dominated by males. We need to create opportunities for women to network, and teach them techniques for networking! Most women network already by asking friends about restaurants recommendations, doctors, etc, but they are less likely to network professionally. Networking within the profession should be a continuous activity, not just when a person is looking for a job. It is there to stay in touch with what is happening in the technology area, get a handle on best practices to be learned from others and explore ideas for the next career step. I have talked to women in technology about networking at universities and conferences, often in a workshop environment and hear lots of hesitations of why women don’t feel comfortable about networking. The top three reasons are: because it may look like boasting; they don’t know what to say or there is just not enough time. So let me address these individually, describing successes is not boasting. Remember that others can learn from career successes as well. Taking the time to prepare 3-4 points ahead of the networking event will avoid the worry of not knowing what to say. As for not having enough time, networking may actually save time by finding out about new opportunities or best practices. Networking doesn’t have to be at a formal event. It can be as simple as getting IT coworkers together for a monthly lunch, or even having a craft night, both of which I have done. The crafting was fun, but it was really an opportunity to connect at a closer level to see what is happening in other areas and just talking about opportunities to advance career wise, to get intel on upcoming projects to further our careers. There are organizations like the Vancouver Women in Technology (VanWIT.ca) where like minded women get together to support each other. We as in women in IT, all have to work together in order to get more women working in technology, not just because there is a skills shortage but also because it offers often flexible hours and workplace locations (home or office) and it being one of the higher paying sectors. We need to provide networking opportunities and coaching to encourage women to work and stay working in the technology field. Maybe then the number of women working in the technology field would stop dropping, and eventually we may even see an increase!